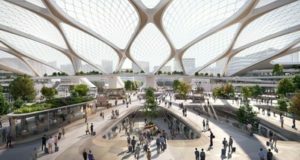 The UNStudio Futures Team presented its vision for the “Station of the Future” at the first edition of HyperSummit, which took place in Utrecht, the Netherlands on September 13, 2018. It was organised by Hardt Hyperloop. UNStudio’s Futures Team partnered with Hardt Hyperloop to create a vision for the urban integration of the hyperloop in cities and towns of different sizes and in different locations within these cities: city-centres, borders or adjoining an infrastructure hub, such as an airport. The hyperloop offers to fulfil a dual purpose, for the fast transport of humans and goods alike. At speeds between 600 and 1000 km/h – it can travel at the same speed as airplanes but deliver passengers to the heart of cities. This means that the stations themselves can be programmed around the benefits of speed, incorporating on-demand workspaces, markets for fresh food, picked or caught elsewhere the same day and even accommodating emergency medical services where time is a crucial factor in saving lives. Using technology powered by solar panels, hyperloop will produce no sound or environmental emissions and can provide the necessary energy to power itself. It will be the first ever 100% electric transport system that can safely transport a high volume of passengers from city to city at unprecedented speeds and journey times. Hyperloop stations can also act as a batteries for solar energy produced, not only by the station itself, but also along the network. Surplus energy can be used to power the autonomous vehicles, buses and bicycles which passengers can switch to in order to complete their journey. Commitment to connected modularity is at the core of the hyperloop system. It also forms the basis of UNStudio’s vision for the hyperloop stations. From platforms to functional spaces and to the roof which extends out over the transfer hubs, a modular design framework organises and connects all parts. 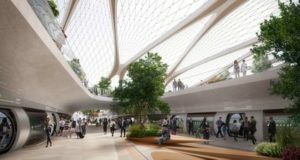 Hardt Hyperloop also shared the results of the Amsterdam-Frankfurt kick-off study and Royal Schiphol Group announced the launch of a joint research study into the feasibility and applicability of a hyperloop connection. The research revealed among other things that an Amsterdam-Frankfurt route is 450 kilometres long and that the journey, with seven intermediate stations, would take around 53 minutes. This stands in sharp contrast to the four hours it would take using regular transport. This route alone could serve more than 4.3 million residents and the hyperloop could carry more than 48 million passengers annually. 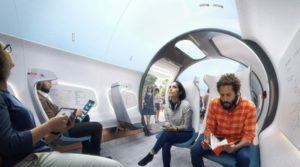 The hyperloop would provide a sustainable alternative for the approximately two million airline passengers annually – saving 83,690 tonnes of CO2 emissions each year.